Recently Carducci Tactical had the opportunity to travel to Salt Lake City, Utah. It was our first time visiting the great state of Utah and we were not disappointed. From Rifle Golf at Spirit Ridge to trap shooting at the Bountiful Lions Club, we found shooting activities anyone would enjoy. We will be reviewing in great detail rifle golf at Spirit Ridge in Box Elder County. Danny had the opportunity to shoot targets at 1000 yards – and he hit it! His adventure even included hitting a shot at 200 yards with a rimfire .22 pistol. What is rifle golf? Rifle Golf is a new shooting sport that combines the skills of long-range shooting with the scoring elements of golf. It’s been described as golf with a gun, an ATV and no dress code. Until our review you can check out their website and if you are in northern Utah – don’t miss this once in a lifetime chance to shoot up to 1,300 yards! 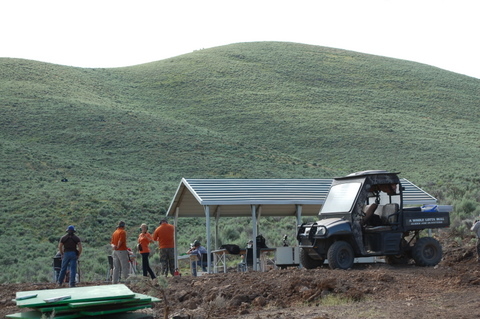 Amy had the opportunity along with Danny to try trap shooting at the Bountiful, Utah Lions Club Range. Who could turn down shooting trap while over looking the Great Salt Lake? The Bountiful Lions Club has a long tradition of serving the community and helping with sight conservation. Through fund-raising projects the club is able to donate money to charitable programs for eye centers, leader dog training, eye glasses to underprivileged children and more. 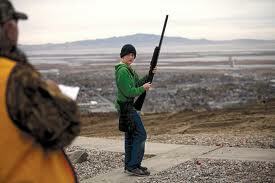 Since 1941 the club has attracted shooters from all over the Salt Lake City area. While in the Salt Lake City area head north to Ogden and check out the John M. Browning Fire Arms museum and see the original 1911 among other important guns designed by Browning. Did you know Browning was born in Ogden, Utah? Browning’s inventions dominated the field of firearms during his time and are the basis for many weapons still in use today. Got time left? In Ogden you can hike, fish, mountain bike or sit back enjoy the view of the Wasatch Mountains. A unique visitor’s attraction is the Eccles Dinosaur park. We spent an afternoon dwarfed by life-sized reproductions of dinosaurs. Finally if you are going to be near Salt Lake City February 9th – 12th, 2012 don’t miss the Mule Deer Foundation’s Western Hunting & Conservation Expo. The Expo will include more than 500 exhibits featuring products and services designed for the outdoorsman. Activities will include seminars, celebrity appearances, entertainment, banquets, live auctions, drawings for hunts – all designed with the hunting enthusiast in mind. Utah takes pride in having an outdoor activity for everyone. From shooting to hiking or shopping – we found it all while surrounded by beautiful mountains and friendly people. For those looking for a new adventure try rifle golf and to start off 2012 with a bang – check out the Expo in February. We can’t wait to go back and we didn’t even mention our day spent on Antelope Island watching the bison or our trip to the Snowbird Resort for Alpine sliding or the zip line. Utah really is an outdoor lovers dream come true! This entry was posted in Ranges, Shooting Events and tagged bountiful lions club range, browning museum, Carducci Tactical, eccles dinosaur park, gun golf, john m. browning museum, mule deer foundation expo, ogden dinosaur park, ogden utah, rifle golf, salt lake city 2012 conventions, spirit ridge rifle golf, trap shooting in utah, utah gun ranges, western hunting and conservation expo, western hunting and conservation show. Bookmark the permalink.